Discussion in 'vBench (Works in Progress)' started by MarquisMini, Feb 8, 2009. 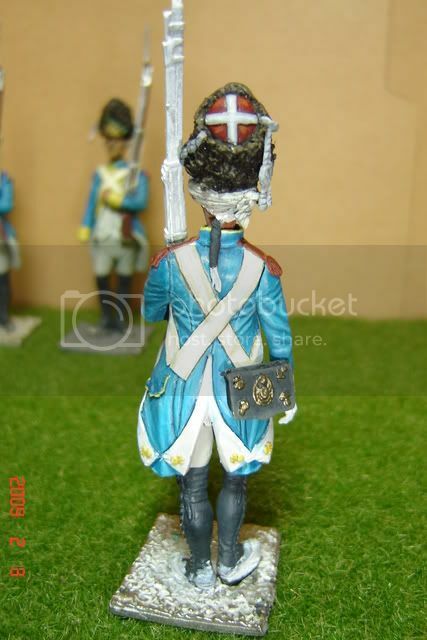 Back in action after several months break due to life's complications...so thrilled to return to painting miniatures, see the work that many of you have completed in the meantime (too many great things to mention) and to continue the Yorktown (American Revolution - French forces) diorama. 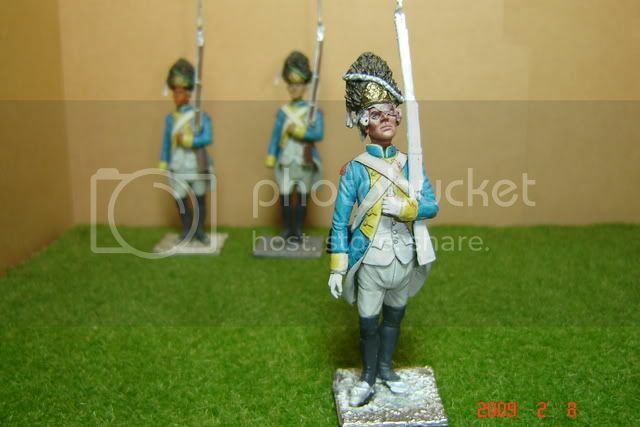 Many of you will remember that I am working in 54mm scale (though most figures are closer to 60mm) and the completed diorama is expected to include over 40 figures and be four square feet in dimension. 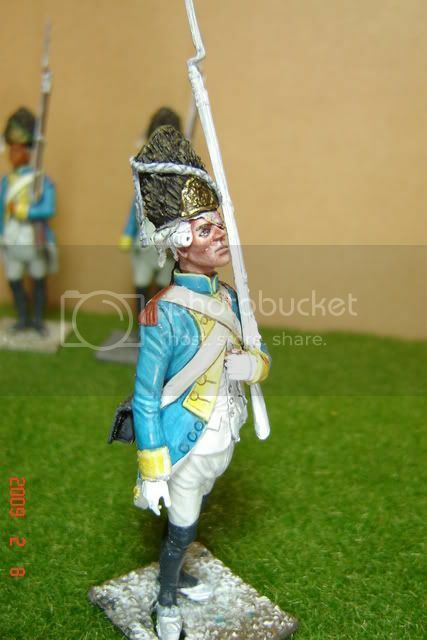 Below are a few photos of a Grenadier (in progress) for the Royal Deux Ponts regiment. Figure includes some stock parts from Cyrille Conrad that have been modified using MS, head from JMD, and some custom sculpting of my own. Your thoughts, criticisms, and suggestions are welcomed. Nice to see you back and posting Daniel, it's good to see some more excellent progress on your project. The face looks nice and the contrast on the coat is looking nice too. Daniel you did some good work. If i may: the colors of the book seems alot darker then you have painted. Your shading color looks like it should be the base color. Thank you all for your comments!.Sometimes i feel like this is a lifetime project and i enjoy every minute of it.The best part is that i get to improve skills and share my work with all of you,and that helps to be more enjoyable. Marc,i agree with you on that,but unfortunatelly this is a problem that i run very often when i take a picture of my figurines.Real life,the color of the coat is damn close to the reference color plates that i have(i use osprey , Eugene Leliepvre and other sources),for some reason they look " turquoise" here. I am a freak when it comes to color accuracy,i research for days and weeks,mix my palette many times ,but at the end i learned from this forum and i have to agree that whatever works for one's is probably the way to go. I can't tell you how many times i have search for the "perfect crimson",only my best friend knows . I thank you for your observation and i welcome any advise ,that's how we learn.